Beautiful 2.36ct oblong sapphire and diamond Edwardian style cluster ring. Made in Chichester, England. Tanzanite and diamond cluster rings. Made in Chichester, England. Round and baguette cut diamond and oblong cushion cut sapphire triple cluster ring. Made in Chichester, England. Platinum sapphire and diamond round cluster showing diamond set gallery. Made in Chichester, England. 1.17ct sapphire, round and baguette diamond Art Deco cluster. Made in Chichester, England. Modern style claw set platinum mounted diamond and sapphire three stone ring. Made in Chichester, England. 3.04ct pear shaped sapphire and diamond set (our customers stones). Made in Chichester, England. 0.99ct deep blue sapphire and diamond set split shoulder ring. Made in Chichester, England. Tanzanite and Diamond Ring. The trilliant cut tanzanite is 1.62ct and has been rubover set in yellow gold and on either side, platinum, diamond set, foliate scrollwork. 18ct yellow raised edges. Made in Chichester, England. Platinum cluster ring 4.36ct, surrounded by 22 round brilliant cut diamonds. Each shoulder rub-over set with 1 trapeze baguette, 0.41ct total, F colour, VS clarity, and grain set with 5 graduating round brilliant cut diamonds, customer's diamonds 0.33ct total & supplied diamonds 0.44ct total, size M. Hallmarked, including Chichester Cross mark. Made in Chichester, England. Platinum mounted, five stone sapphire and diamond ring. Made in Chichester, England. 1920’s style platinum mounted diamond and sapphire landscape set cluster ring. Made in Chichester, England. Platinum mounted sapphire and diamond 1920s style cluster with split shoulders. Made in Chichester, England. 8.63ct pear shaped tanzanite and diamond ring. Made in Chichester, England. Sapphire and diamond cluster ring. Made in Chichester, England. Platinum mounted 2.27ct sapphire and diamond claw set cluster. Made in Chichester, England. 5.03ct sapphire and diamond 1.03ct modern style claw set platinum cluster ring. Made in Chichester, England. 2.08ct cushion cut sapphire in 1920's style daisy edge millegrain cluster ring. Made in Chichester, England. Octagonal 2.00ct sapphire and princess cut diamond 3 stone ring. made in Chichester, England. Sapphire and diamond Edwardian Style Cluster Ring. The central rectangular faceted sapphire is 1.58ct and is rub over set with a millegrain edge, on either side are 2 baguette diamonds, surrounded by further round brilliant cut diamonds, including on the split shoulders. 2 round brilliant cut diamonds are set inside the split shoulders on either side, all set with a millegrain edge. Total diamond weight is 0.61ct graded for colour and clarity as G, VS/SI respectively. Hallmarked 950 for platinum, with the Chichester Cross mark . Total gross weight is 7.9g Made in Chichester, England. 18ct white gold and platinum mounted diamond and sapphire cluster rings. All three made in Chichester, England. Platinum mounted cushion cut sapphire and wide baguette diamonds. Made in Chichester, England. Oblong cushion cut sapphire and diamond platinum cluster ring. Made in Chichester, England. 1.95ct Sri Lankan oval sapphire with platinum and 18ct yellow gold mount. Diamond weight 1.08ct total. Made in Chichester, England. 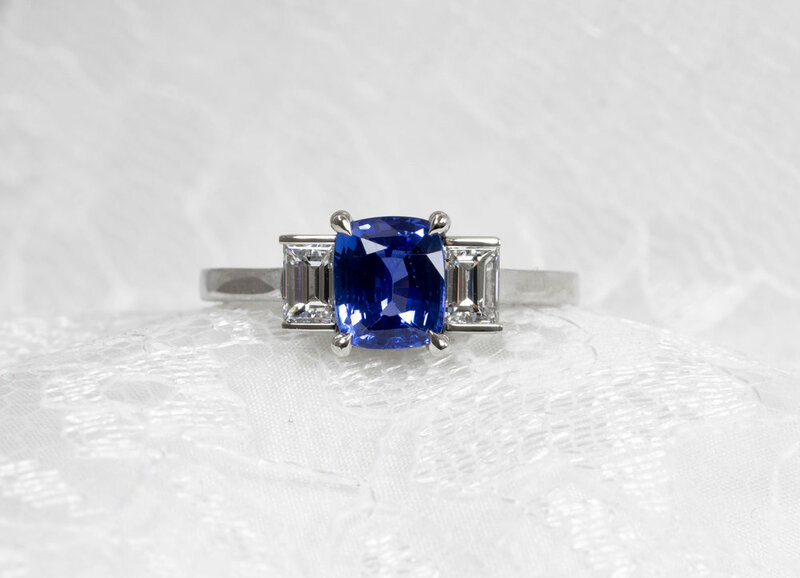 Platinum mounted oblong cushion cut Sri Lankan sapphire and baguette diamond set 3 stone ring. Made in Chichester, England. Platinum mounted teal sapphire and diamond baguette shoulder ring. Made in Chichester, England. Platinum mounted pear-shaped sapphire and diamond Edwardian style tiara ring. Made in Chichester, England.